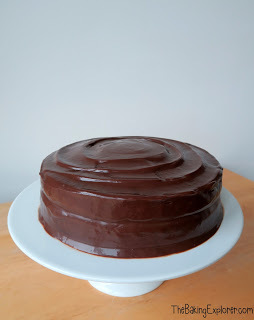 Can you believe this is the first Chocolate Fudge Cake I’ve ever made? 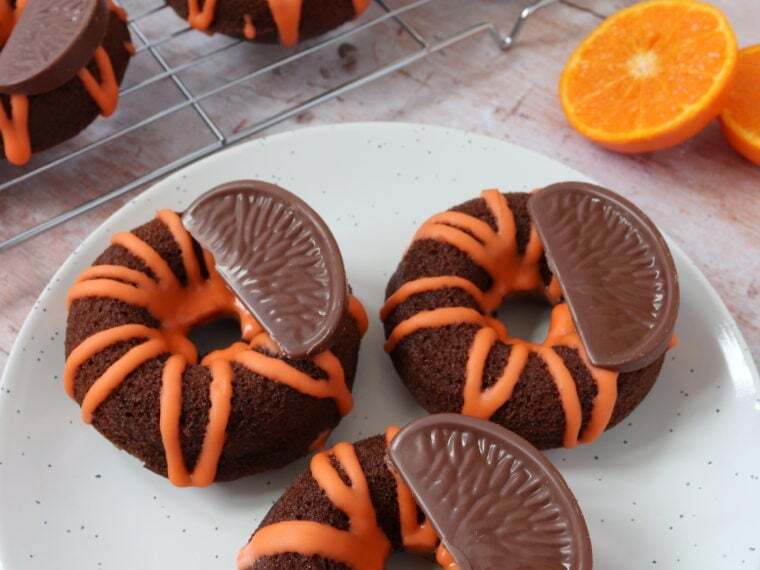 I’ve recently realised that there are quite a few ‘classic’ bakes that I haven’t made or featured on this blog and I would like to change that. I was also looking through my recipe books over the weekend and there were so many recipes that I’ve never made but I really want to try. So I’m going to make an effort to not only make more from my recipe books, but also to try some classic and well known bakes that I’ve never made before. 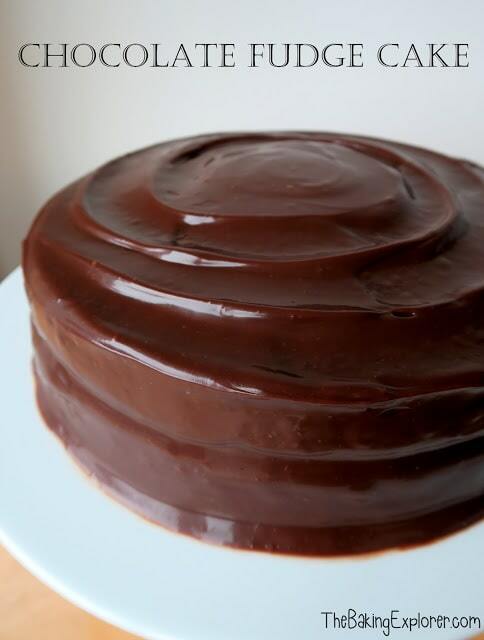 This Chocolate Fudge Cake covers both angles as the recipe is from What to Bake & How to Bake It by Jane Hornby. I made this cake for my dad’s birthday as he is a big fan of chocolate and I knew it would go down well with the whole family. 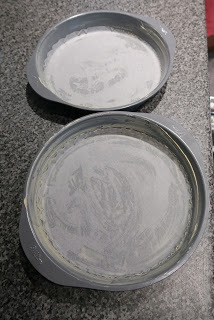 First I greased and lined two 23cm sandwich tins. 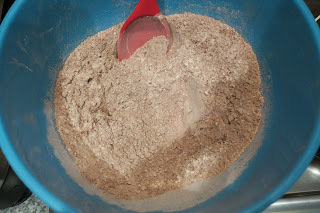 I started by sifting plain flour, cocoa powder, bicarbonate of soda, baking powder and salt into a bowl and mixing it together. 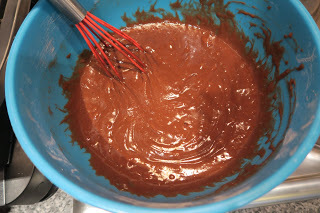 I then added light brown soft sugar and mixed it in, trying to break up any lumps. 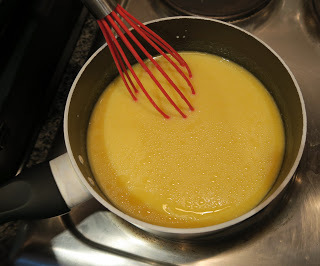 In a pan on a low heat I melted butter then stirred milk, vegetable oil and vanilla extract into it. 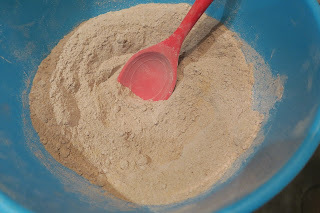 I poured the wet ingredients into the dry and mixed it all together well. 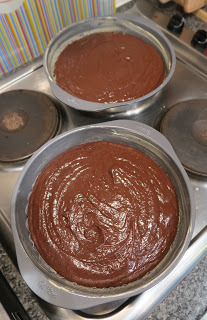 I split it evenly between the two tins, I weighed the mixture for extra accuracy. It baked on 180C/160C Fan/350F/Gas Mark 4 for 30 minutes. I took them out, removed from the tin and left to cool. 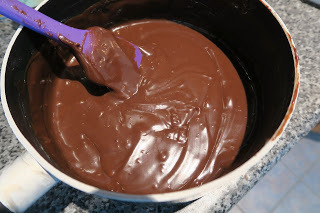 To make the chocolate fudge frosting I heated condensed milk with double cream in a pan on a medium heat until it bubbled. I stirred it for about 5 minutes, then took it off the heat and added butter, dark chocolate and vanilla extract. Once they melted I stirred the mixture and left it to cool completely. It went thicker and very shiny. I put the first sponge on a cake stand and spread frosting over it. I added the other sponge layer and covered the whole cake with the frosting. You could add extra decoration like raspberries, or white chocolate curls, but I decided to keep the Chocolate Fudge Cake simple in keeping with my classic theme. My dad was really happy with the Chocolate Fudge Cake and it went down very well! 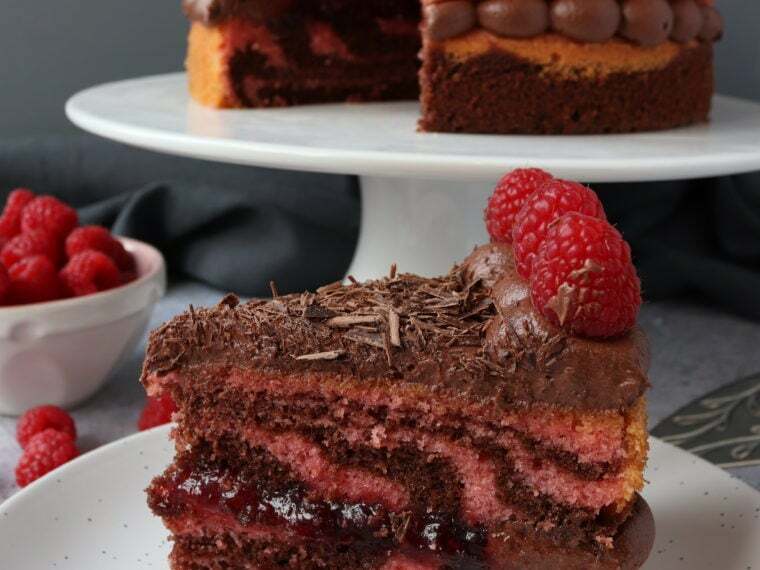 The sponge was lovely and moist, with just the right amount of chocolate flavour to balance out the intense chocolate sweetness of the decadent frosting. This would be amazing warmed up with vanilla ice cream too. It’s coincidentally an egg free recipe too, so perfect for anyone with an egg allergy. 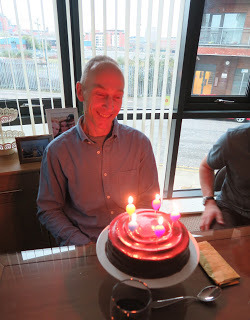 Here is my dad with his birthday cake looking very excited! I managed to snap a quick picture of the cake sliced before it got eaten up! 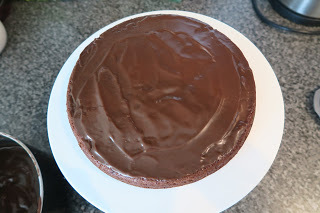 I am entering this into Recipe of the Week hosted by A Mummy Too. And to Tasty Tuesdays by Honest Mum. Thanks Kate, that's so nice of you to say! I really haven't made it before, but I think it needs to happen more often now! I have to admit I did warm a slice up and have it with ice cream – it was heavenly! Chocolate cake should be really chocolaty and this certainly sounds it. 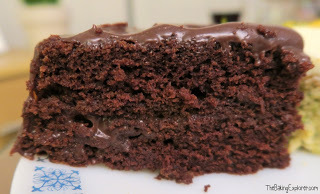 I have made chocolate fudge cake before, but the recipe was quite complicated, this recipe sounds alot simpler. Saving for future reference. Hi Debbie, it was really easy to follow, I hope you enjoy it as much as I did! Happy birthday to your dad! The cake looks delicious, a chocaholic's dream. 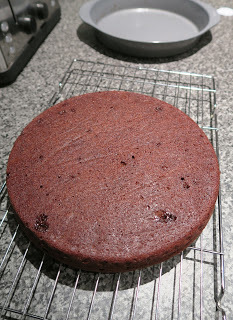 I often weigh my cakes to ensure the layers are even. Hmm.. makes me feel like baking a chocolate cake now! Hi Clare, yes this recipe is egg free!